Arthropods are animals with an external skeleton. They are the most abundant animals on earth, but are often misunderstood. Spiders, millipedes and other arthropods are often mistakenly referred to as "insects" and "bugs." This poster brings clarity to the confusion. Each of the five sub-phylum is carefully explained. Highly detailed illustrations show an incredible 98 species, many life-size. All are accompanied by common and scientific name. 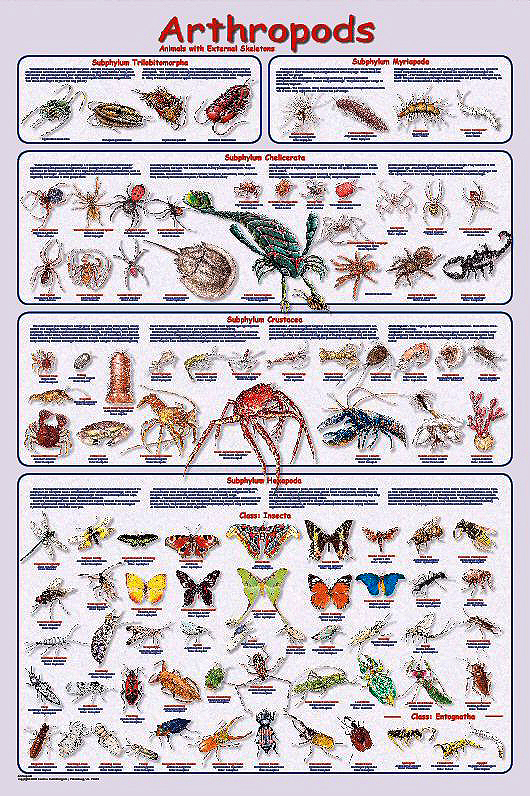 Insects account for the great bulk of the arthropods and this poster includes representatives of most orders. The Crustaceans include crabs and lobsters, but also shrimp, krill and even barnacles. (Yes, a butterfly and a barnacle are related!) The poster even shows the giant sea scorpion; this long-extinct animal is the largest arthropod to have ever lived. It reached a length of six feet. This remarkable poster even includes the prehistoric trilobites. They were the dominant life form during the Permian, but were totally destroyed by the mass extinction. North American species are shown whenever possible.